Our programs are designed to provide hands-on training and instruction in key subjects that are critical to nonprofit effectiveness. We have chosen “hot topics” in which nonprofit organizations face ongoing challenges. Our goal is to provide information, education, and tools that equip participants in implementing systemic changes that provide for sustainable, effective, and accountable operations. We want to support an organization’s quest toward, “mission accomplishment” through its incorporation of the most appropriate Best Practices within its organization. 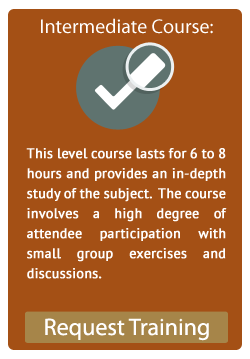 All of our courses are presented utilizing a combination of lecture, facilitated discussion, case study, small group exercise, individual exercise, and/or role-plays. We want your experience to be meaningful, effective, and fun! All courses can be presented to a single nonprofit organization, a group of organizations, or at a conference, board retreat or other gathering. 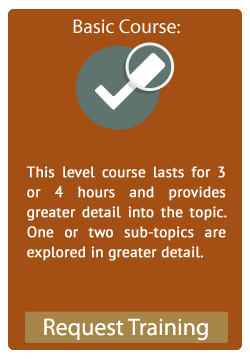 Most individual topics can be customized to fit into one of the three levels described below. 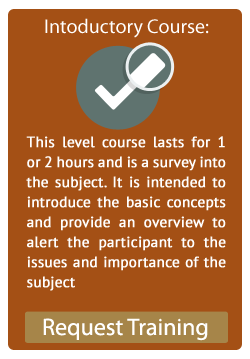 Organizations can create their own series of trainings by choosing a topic and progressing through Levels 1, 2, and 3 (if applicable) on that single topic before advancing to another topic. Or an organization may choose a topic at a specific level and receive that one training, then advance to another topic.